We’re now just one step away from the top-ten in our 2017 Prospect Rankings series. Montreal’s 2017 draft class is well represented here as three of their selections are included in this grouping. Similar to the NHL, there are teams at the WHL level that are way below average and that was the case with the team Fleury was on last season. He was unquestionably their top defender and got to play in all situations but on the down side, he was on for an absolute boatload of goals against and that certainly didn’t help when it came to draft day. Just recently, Fleury’s rights were dealt to Regina and the Pats happen to be hosting the Memorial Cup in 2018 so he’ll be guaranteed to suit up in this tournament. On that team, he will have the chance to be more of a complementary piece which hopefully will help him work on some his defensive deficiencies. He should be plenty motivated to do so as the Habs can turn him pro next season if they want so there is a potential contract to play for. NHL ETA: 2021-22/2022-23 – Fleury has an intriguing skill set but his in-zone play needs some work and it’s hard to imagine that improvements there will come particularly quick. While Montreal has turned players pro in their draft +2 year in the past (with players like Nikita Scherbak and Brett Lernout), it wouldn’t be surprising to see him stay for the extra year in junior either where he can develop against lesser opposition. He’s certainly a project but a pretty interesting one overall. While Fleury is more ofa risky player, Walford is the opposite. He’s more of a typical stay-at-home player than someone who is going to actively jump up into the play on a frequent basis. He has shown flashes of offensive upside (such as the end of last season) but it hasn’t been with the consistency to suggest that he could be a two-way player at the next level. Instead, the Canadiens will have to settle for Walford being more of an old-school type of defender, someone that will play a physical game and take care of things in his own end. Considering their dearth of quality left-shooting defensive prospects at the moment, they’ll be okay with that as well even though his overall potential may be limited. NHL ETA: 2021-22 – I like to project most defencemen to exhaust their waiver-exemption before thinking they could make an NHL roster but Walford might be someone to come a little quicker. It’s hard to project him higher than a third-pairing player at this point so once he shows that he could handle 15 minutes a night, there might be a spot for him, especially if their depth on that side doesn’t improve much between now and then. 2016-17 didn’t get off to a great start as Bitten was in limbo at the beginning as it took a bit of time for his trade request from Flint to be granted. He landed in Hamilton but wound up taking a demotion in terms of his role (from the first line in Flint to the second with the Bulldogs) and it took him a while to adjust. He improved as the season went on and wound up at just over a point-per-game average for games played in 2017. While he was drafted as a centre and spent a good chunk of time there last year, I think he’s going to have a hard time staying there and to be honest, his style of play is better suited for the wing anyway where he can get more involved in puck battles. Considering the Habs haven’t hesitated to sign draft picks a year early, I was a bit surprised he hasn’t signed by now but there’s little reason to think they won’t offer him a contract by the June 1st deadline. NHL ETA: 2020-21/2021-22 – Bitten is likely going to be a bottom-six pesky forward in the pros and if he can have success in that role in Laval over his first professional season or two, I think he could move up somewhat quickly. If he winds up developing at a slower pace as a long of players like him have done in recent years, then he’s going to be a longer-term project despite the lower overall upside. Brook is a defender who doesn’t have any glaring weaknesses to his game which is impressive for a junior player. However, there also isn’t a high-end element that really makes him stand out either. That makes him a pretty safe prospects overall but another one whose overall upside might be somewhat capped. He made good strides in his offensive game last season and as the league trends towards more mobile blueliners, Brook was much more willing to get involved in the rush which was certainly a positive. Unfortunately, we’ll have to wait a while yet to see if that progress carries over into this season as he has yet to play in 2017-18 due to a shoulder injury. NHL ETA: 2022-23 – Despite being somewhat of a ‘jack-of-all-trades’ type of defender, I can still see Brook needing three years in the minors to really be ready for a full-time NHL spot. Players like that tend to start on the third pairing and gradually work their way up. If he stands out and makes a big impact quickly, the timeline could move up a season but I’ll ere on the side of caution with this one. As expected, Lernout moved into more of a regular top-four role last season after spending most of his rookie year on the third pairing. He cut down a bit on the penalties although discipline is still a bit of an issue at times. Offensively, he didn’t make much strides there which was a bit of a surprise given his junior numbers and the fact that St. John’s defence had very little offensive upside for big chunks of the season; it’s not as if he didn’t have his opportunities. This season, the goal for him should be to hold down a top pairing spot, do a better job at staying out of the box, and continue to improve his all-around game. He’s 0/3 on that front so far. 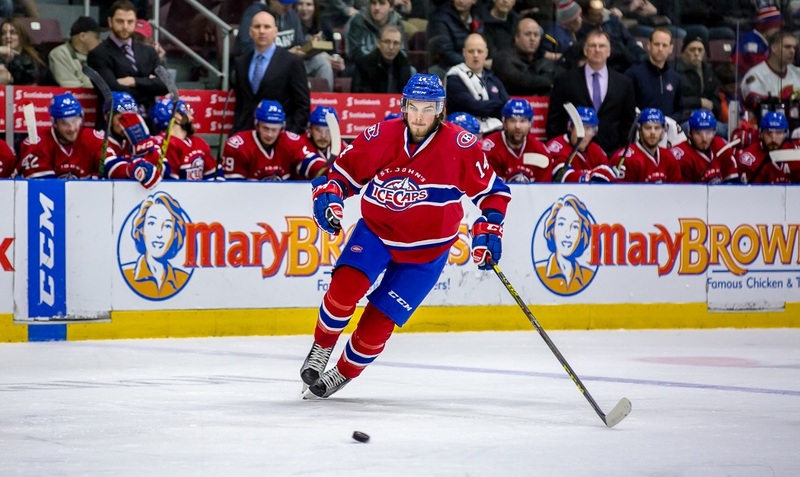 With Jakub Jerabek spending time on the right side, Lernout may not be poised to be the first player recalled if someone on that side in Montreal gets hurt. It’s still early but he will need to turn this around. NHL ETA: 2018-19 – Lernout will be waiver-eligible starting next season and there’s a good chance the Habs will keep him up. Whether it’s as a regular on the third pairing or as a reserve remains the question. At the beginning of the season (when the rankings were done), the former seemed likely but that may not be the case now.